Rees Morgan Meghan 27-String Concert Lever Harp — Rees Harps Inc.
Rees Morgan Meghan 27-string concert lever harp. Lever harps are often also called Irish harps or Celtic harps. We are also the makers of Harpsicle® Harps. Rees has been building harps since 1972. Our harps are hand crafted in Rising Sun, Indiana, United States. Rees Morgan Meghan Harp in walnut with full Rees sharping levers and optional hand painted dragonflies. Included display stand not shown. Rees Morgan Meghan Harp in walnut. Shown on adjustable stand (not included with harp). Rees Double Morgan Meghan Harp in walnut with full Rees sharping levers and optional orange hand painted Butterfly ornamentation underneath walnut wood. Also see our Double Harp page. Closeup of Rees Double Morgan Meghan Harp in walnut with optional hand painted orange Butterfly ornamentation underneath walnut wood. Also see our Double Harp page. Rees Double Morgan Meghan Harp in walnut with full Rees sharping levers and optional hand painted blue Butterfly ornamentation under walnut wood. Also see our Double Harp page. Closeup of Rees Double Morgan Meghan Harp in walnut with optional hand painted blue Butterfly ornamentation underneath walnut wood. Also see our Double Harp page. The Rees Morgan Meghan Concert Line Harp is a little big harp. This is a lap harp which competes favorably with many floor harps in size and color of voice. Like all Rees Concert Line Harps the voice of the Morgan Meghan is balanced and, unusual for a lap harp, the bass is open and deep. The Morgan Meghan Harp comes with full Rees sharping levers and harp pins. Depending upon the wood selected the Morgan Meghan weighs about 10 pounds (5.53 kg). The Morgan Meghan is 34 inches (86.4 cm) tall at the point. Like all Rees Concert Line Harps, the Morgan Meghan includes a lifetime warranty. The base price on a Morgan Meghan is $2400 US. We require 25% of your initial order at the time the order is placed. 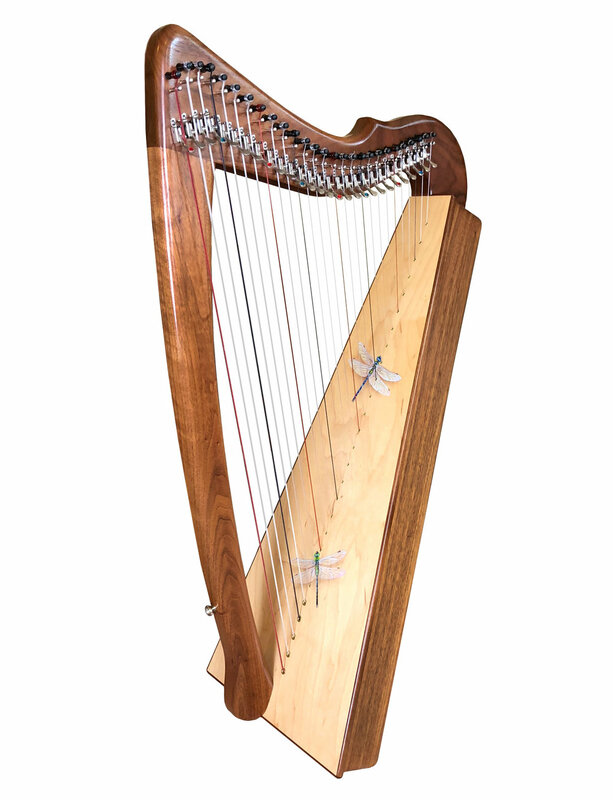 Prior to ordering any Rees harp please carefully read our Terms and Conditions and our Ordering FAQ page. If you are ready to order now just head on in to our Rees Marketplace. From our standard ornamentation catalog this is Starry, Starry Night in gold with a Celtic Border framing the soundboard. Each Rees Concert Line harp we make is a work of the art of lutherie, the building of stringed instruments. Rees Harps takes that one step further by offering optional ornamentation. Think of your harp as a palette. We offer many options within our standard ornamentation catalog and we invite you to create. Fully custom ornamentation is also available in consultation with our artists. Many people request a clip of the harp being played. We are happy to provide one but with this basic understanding: any harp will only sound as good as the speakers and the bass and treble pre-sets of your computer. In other words, in many ways our harp will sound like your computer. Additionally, you have no way to compare one harp to another via Mp3 because you have no control over the recording conditions and variables. If you are listening on iTunes, on a computer, you can improve the quality of what you hear in the iTunes Application by going to Window then to Equalizer and, within the equalizer, selecting Acoustic. You might want to boost the Preamp a bit too. If you do this before you play the clip below you may have a result which is a bit closer to how the harp really sounds. Darlene Walton began her harp life on a Rees and was our showroom manager for many years. Now she has retired but keeps herself more than busy teaching beginning harpers from around the world through her website. We also carry Darlene's wonderful books of music in our Rees Marketplace. We invite you to be in our gallery.